Tax Alert: Summary of New Tax Relief Proposal | The Levin Law Firm - Philip Levin, Esq. As part of the tax cut deal announced last week, President Obama reluctantly agreed to a federal estate tax with a $5 million exemption per person and a relatively low 35% top rate for two years. The President originally wanted the tax to return to its 2009 level, with a 45% rate with a $3.5 million exemption. The bill puts into writing the agreement reached between President Obama and Senate Republicans a week ago to extend the Bush income tax cuts and bring back the estate tax with a very high exemption. For details about what the bill says with regard to estate taxes, gift taxes and generation-skipping transfer taxes, refer to a summary of the Reid-McConnell Tax Relief, Unemployment Insurance Reauthorization and Job Creation Act of 2010, which extends the Bush tax cuts for two years. Temporary estate, gift, and generation skipping transfer tax relief. The EGTRRA modified estate and generation-skipping transfer taxes, resulting in a repeal of federal transfer taxes in 2010, lowered the gift tax rate to 35 percent, and increased the gift tax exemption to $1 million during 2010. The new tax proposal sets the exemption at $5 million per person [$10 million per couple], with a top tax rate of 35 percent for estate, gift, and generation skipping transfer taxes for two (2) years, through 2012. Until Congress acts, of course, the estate tax is set to return in 2011 with a $1 million exemption and a 55% rate. However, that’s not likely to happen. And even if Congress miraculously reaches a resolution and passes estate tax modifications before the current session ends, by its own design, the resolution will only be good for two (2) years. 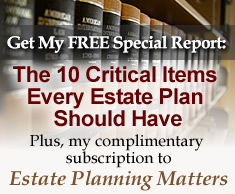 Be sure to subscribe to my newsletter, Estate Planning Matters, to stay in the loop about current issues that impact your estate planning. The Levin Law Firm works with individuals and families to develop comprehensive estate and business succession plans. Please call The Levin Law Firm to arrange a Complimentary Consultation at (610) 977-2443. Note: If you choose to read the summary of the act, under the portability heading, reference to the “current $7 million exemption per couple” is erroneous, as there is no estate tax this year. The estate tax exemption was $3.5 million per person in 2009.